Drawing from Memory by Allen Say. Grades 4+ Scholastic Press, September 2011. 63 pages. Reviewed from galley provided by publisher. When an editor tells you that an upcoming book is a "career-making book" for the author and said author has already won a Caldecott medal, you sit up and take notice. 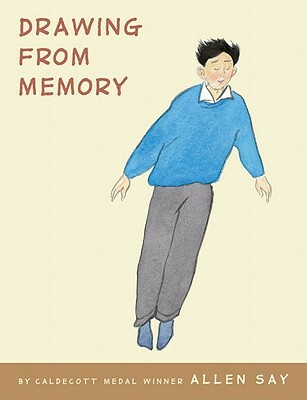 Drawing from Memory is the story of Allen Say's childhood, growing up in Japan during WWII and its aftermath. It's the story of a boy who would do anything to pursue his dreams, including leaving home and getting his own apartment at the tender age of 12. It's a picture book. No, it's a graphic novel. No, it's an autobiography. No, it's all three combined in a way that is utterly unique. Allen Say was born in 1937 in a seaside village in Japan. Unfortunately, his mother was terrified of the water, so Allen spent a great deal of his childhood indoors. He learned to read at an early age and he loved, loved, loved to draw. When he told his father that he wanted to be a cartoonist, his father was appalled. So Allen drew while his father was at work and then hid the drawings when his father came home. Mr. Say tells his story in a mixture of mediums, including watercolor paintings, cartoons, pen-and-ink drawings, and photography. The book is rife with emotion - gray watercolors depicting the destruction and despondency after WWII bombings, brightly colored pen-and-ink drawings showing his path to find his mentor and his happy time spent drawing and painting. Of course, any librarian will tell you that an autobiography written on a grade-school level is a treasure. (Such things are often assigned and great ones are hard to come by!) But this book is a treasure unto itself. It will give readers a look into another culture, another time, another life. And it's obviously a treasured journey for the author as well. When I finished the illustrations for this book, I sent Chieko-san the original drawing of her mother. She thanked me and wrote: "About one year before my father died at age eighty-seven, on February 20, 2002, I asked him if there was anything he wanted to do. He looked at me steadily and said, "Kiyoi is the treasure of my life. I want to work on a book with him. '"This is that book. This book must find its way into the hands of young artists and would-be illustrators. I'd also hand it to fans of Peter Sis's books - his graphic memoir The Wall, but also his picture book biographies The Tree of Life and Starry Messenger. Drawing from Memory will be on shelves in September 2011! And hey, it's Nonfiction Monday! This week's roundup is over at proseandkahn.